Description Sulfo-NHS-LC-Biotin is an intermediate length, water-soluble biotinyltation reagent used to attach biotin to primary amines. Soluble in Water, DMSO or DMF. Sulfo-NHS-LC-Biotin was dissolved in PBS at a concentration of 0.5 mg/ml. 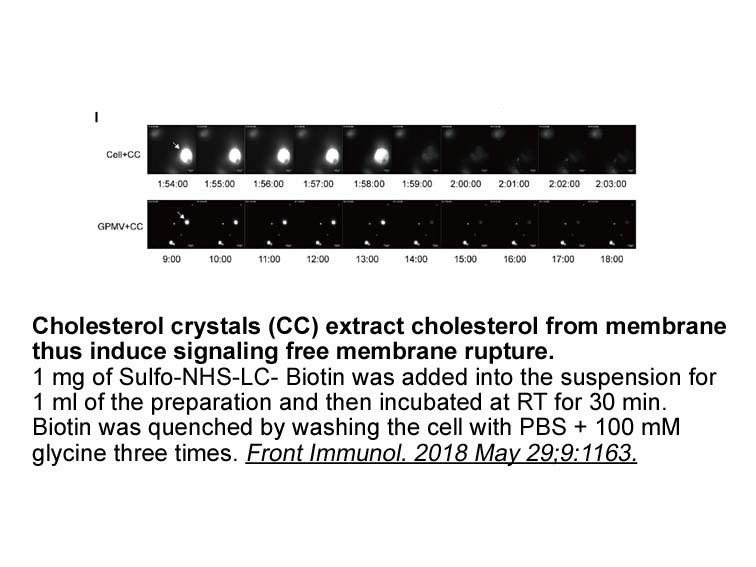 then it was incubated with cardiomyocytes at 37ºC for 2 h. After that the cells were washed twice in cold PBS with 100 mM glycine and twice in cold PBS alone to remove the excess biotin reagent. To capture biotinylated proteins, 100 μl of streptavidin agarose resin were incubated with each 100 μg of samples for 16 hours at 4ºC. 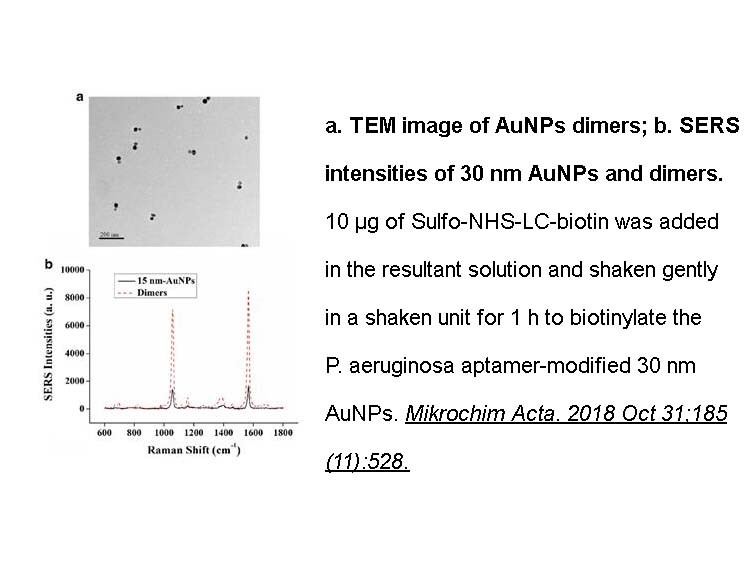 Captured proteins were eluted at 60ºC for 30 min with Laemmli 2X sample buffer which contain 40 mg/mL of dithiothreitol and they were analyzed by Western blot with primary antibodies.
. Charlotte Lorin, Isabelle Vögeli, Ernst Niggli. 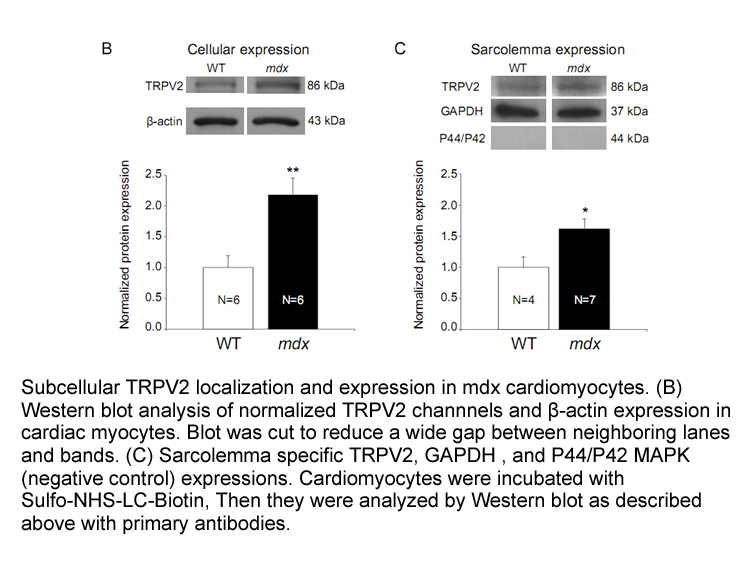 Dystrophic cardiomyopathy - role of TRPV2 channels in stretch-induced cell damage. Cardiovascular Research, 2015. The product is not stable in solution, please dissolve it immediately before use. Sulfo-NHS-LC-biotin (Sulfosuccinimidyl 6-(biotinamido) Hexanoate) is an amine-reactive biotinylation agent. As a water-soluble analog of NHS-LC-biotin, Sulfo-NHS-LC-biotin contains a negatively charged sulfonate group on the NHS ring structure, which creates sufficient polarity within the molecule and allows it to be directly added into aqueous reactions without prior dissolution of organic solvents. Sulfo-NHS-LC-biotin covalently binds to amine groups in proteins and other molecules through its NHS ester forming an amide linkage and releasing N-Hydroxysuccinimide. 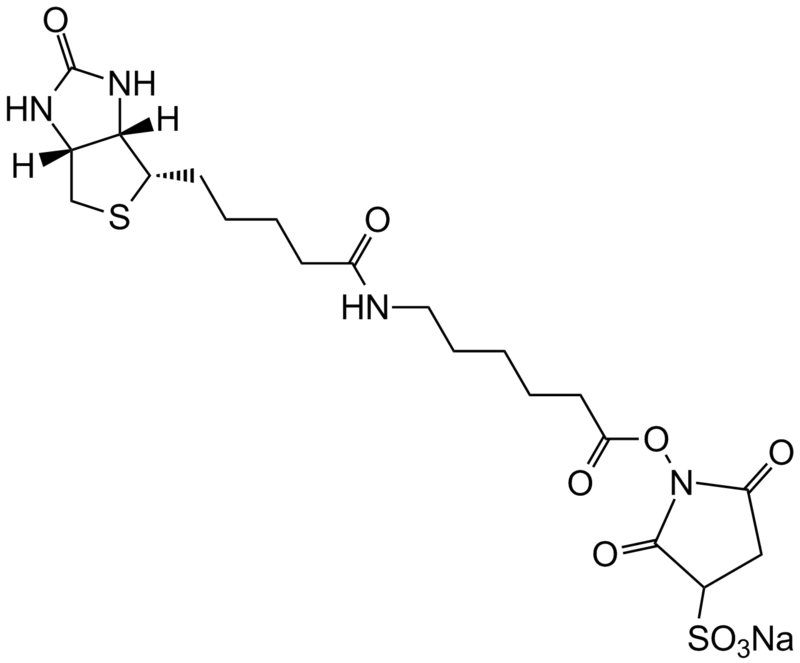 Sulfo-NHS-LC-biotin has a greater length (22.4 A) between a covalently modified molecule and the bicyclic biotin rings than NHS-biotin (13.5 A), which provides the probes a greater opportunity to reach the binding sites deeply buried inside the surface plane of proteins. Bioconjugate Techniques , 2nd ed. By Greg T.Hermanson (Pierce Biotechnology, Thermo Fisher Scientific, Rockford, IL). Academic Press (an imprint of Elsevier): London, Amsterdam, Burlington, San Diego . 2008. ISBN 978-0-12-370501-3.